Baby, it’s cold outside: After five years in hibernation, wearable-hemp designer Rob Jungmann (Jungmaven) is bringing back Manastash, his first eco-outdoor hemp clothing line, launched way back in 1993, when all most people did with hemp was smoke it. The lightweight, breathable, water-repellant jackets solve the drab-yet-functional-jacket dilemma with cool color-blocking, and, as of this week, are available at Hempwise’s I.V. 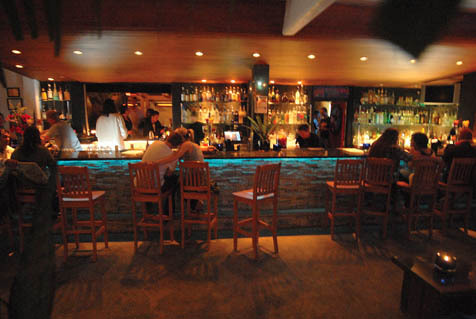 (971 Embarcadero del Mar) and downtown (927 State St.) locations. And they come with a little call to action: the logo encourages jacket purveyors to speak to their state representatives to co-sponsor the Industrial Hemp Farming Act to get industrial hemp legal again in America. Dope. : And if outdoor jackets aren’t your cuppa cocoa, stop into Arcobaleno Trade (1101 State St.) for some Bolivian Alpaca-knit armwarmers, hats, or fingerless gloves. 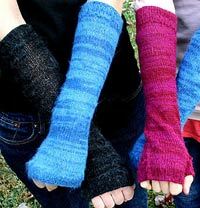 They’re fair trade, they’re fabulous, and they’re called armwarmers. ‘Nuff said. Yester-Yuletide: If your style leans retro, mark your calendars-the once-a-year Cominichi’s (421 E. Cota St.) blowout is coming up. For the weekend of December 18-20, everything in the store will be 20-50 percent off. But vintage duds and Mad Men-inspired decor aren’t the only reasons to stop in: They serve coffee, hot cider, and champagne (that’s “good” champagne, says owner Gina Comin) every day of the sale, and the first day, the action gets going early, at 8 a.m. Which is good news for you-the vendors will all be there, manning their spaces, and many hours of bubbly drinking typically has meant better deals for shoppers. Ho ho ho. Give a little bit: We all wanna do good. But there’re only so many hours in the day, so many bucks in the bank, and shopping-especially this time of year-can take priority. Fortunately, a couple area companies are putting philanthropy first-so you, dear shopper, don’t have to. JP Monkey, whose adorable, reusable totes offer a dose of eco-goodness unto themselves, is doing double-do-goody: This holiday season, they’ll kick down 40 percent from every sale to CALM, the Junior League, or Foodbank; just pick your fave and enter the code (CALM, JLSB, or FOODBANK) at checkout. : And eco-friendly Summer for Kids (1235 Coast Village Rd.) is going huge. After celebrating the store’s first anniversary, owner Adriana Shuman, feeling there was something missing, has decided that, going forward, she’s giving every penny of profit back to the community to make an impact on local kids: come October 2010, CALM and the Teddy Bear Cancer Foundation will score a handsome check, and she’ll announce the following year’s beneficiaries. How’s that for amazing? By now, we’ve all seen enough Project Runway to know that fashion design isn’t for the faint of heart. But when it’s your calling, there’s just no fighting it-a fact to which recent Atlanta transplant Katharine Kidd can attest. After earning a Master’s in special ed and spending several years as a teacher, it was the birth of her first child five years ago that made Kidd rethink things. “I realized that my time was limited, and I couldn’t do something I wasn’t 100 percent passionate about,” she said. So, she started designing clothes for herself. She’d do the sketches, and then have the pieces made. But something wasn’t right. “There was too much of a disconnect,” she claimed. So about two years ago, when she and her family relocated to Santa Barbara, she decided to get serious, found a mentor, and took on every part of the process, from the sketching to the draping to the patternmaking to the sewing. Spring 2010, her first collection (which Kidd showed in New York this past summer and promptly was picked up by several East Coast boutiques), is comprised of two lines: one, high-end, the other, embellished tees. For those who might see a divide there, it’s actually a perfect representation of Kidd’s aesthetic. She describes her style as “mix and match; old-world glamour with a modern twist,” a combination that works together beautifully in pieces like the riding jacket, which has a classic silhouette but surprises with the back’s modern pleating. It’s been a learning process-and she’s content to keep it small-scale for now. While she’s working to get her goods into an area boutique and holding some trunk shows, her bread-and-butter comes in the form of private customers, which she takes by appointment. Old-school meets new. For more, email info@katharinekidd.com. Shop This: If your answer to the age-old question, “If you had three wishes, what would you wish for?” is wine, chocolate, and boutique shopping at 5-30 percent off retail, you are in luck. (What? It’s just me?) Tonight (Nov. 19), from 6-9 p.m., at Eos Lounge (500 Anacapa St.), Jessica Foster is pairing her awesome confections with various varietals for a fabulous exercise in the highest form of gluttony, which will be topped off with a high-end fashion boutique featuring the collection of S.B. clotheshorse Jeff the Cowboy (ahem; that’s Croteau to you and me), which includes pieces from Prada, 7FAM, Diesel, D&G, True Religion, Rock & Republic, Armani, YSL, Versace, BCBG, AG, Burberry, Lucky, and Coach, to name but a boldface few. Vintage threads, sunglasses, and Western shirts will abound (what’s a cowboy without his button-down?). The six-course wine-and-chocolate pairing will set you back $20, and, as for the duds, note to self: the cowboy only takes cash.